Finished to an exceptional standard throughout, this outstanding five bedroom semi-detached house benefits from a generous open-plan kitchen/living area, five bathrooms, private garden and off-street parking. The property backs on to the open expanse of Richmond Park and is excellently located for access on to the A3 for motorist links in and out of London. Local amenities are nearby in both Roehampton and Putney. Serving tasty French food, this restaurant is part of a small chain and has an impressive interior. The atmosphere is really romantic and there's a pretty outdoor seating area too. 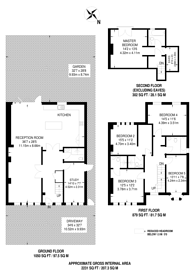 2,231 (207 Sq M) approx.